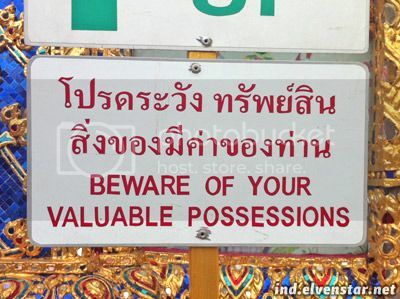 Beware of your valuable possessions. They will eat you if you’re not careful. I don’t find that sort of architecture very interesting (the highly ornate, covered in gold and cut glass, so-detailed-it’s-over-the-top ornamentation and figures that scowl menacingly at you; all derived strongly from a mixture of Buddhist and Hindu artistic influences). I come from Malaysia. It’s not like I haven’t been to any temples before. I’ve seen enough similar stuff that I’m not particularly impressed. I dislike the smell of incense and it was almost everywhere, pervading the buildings. I only took 2 photos at the Grand Palace – the one you see above, and another one of some amusing monkey statues amidst some bushes.